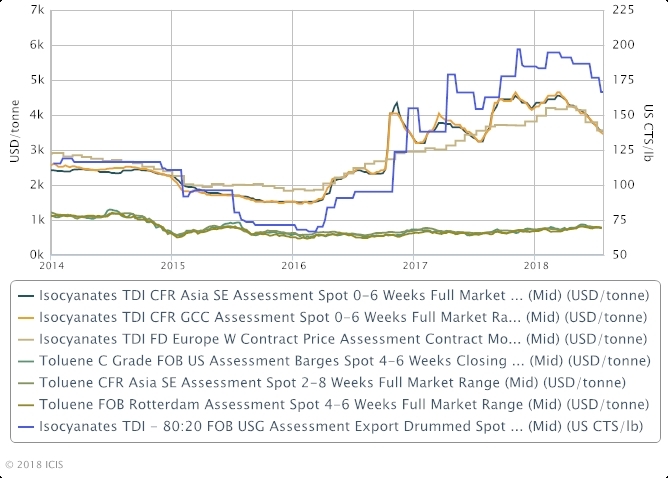 BARCELONA (ICIS)--Toluene di-isocyanate (TDI) prices globally are likely to fall further as the market moves from a sustained period of tightness into overcapacity and lower operating rates as it rebalances following the re-start of BASF’s TDI facility at Ludwigshafen, Germany. The 300,000 tonne/year facility had been due to start up in 2016 but a series of technical problems delayed full restart until now. The global TDI market had been relying on this start-up, plus the 200,000 tonnes/year Sadara facility in Saudi Arabia, to balance supply and demand following the closure of other facilities back in 2014-16. However, the BASF and Sadara start-ups were delayed and a series of other shutdowns and force majeures added to the tightness causing prices to soar, and the spread from feedstock toluene widen, from 2016-2018 as the price chart shows. From June, prices have started to fall in anticipation of the BASF restart. The BASF plant accounts for around 10% of the roughly 3m tonnes/year global TDI capacity, according to ICIS. “The spike in prices has been caused by numerous shutdowns and force majeures, especially impacting the Middle East. TDI was also hampered by the fact that plants shut down from 2014-16 and were not replaced because the BASF and Sadara units did not start up,” said ICIS consultant Rob Peacock. “If BASF ramps up to 80% or more, and sell the product then over the next two-three months, there will be downward pressure on prices in Europe and the Middle East. We don’t have a great amount of visibility on the Sadara plant, but if that has any significant output that will weight on the market in the Middle East," he added. 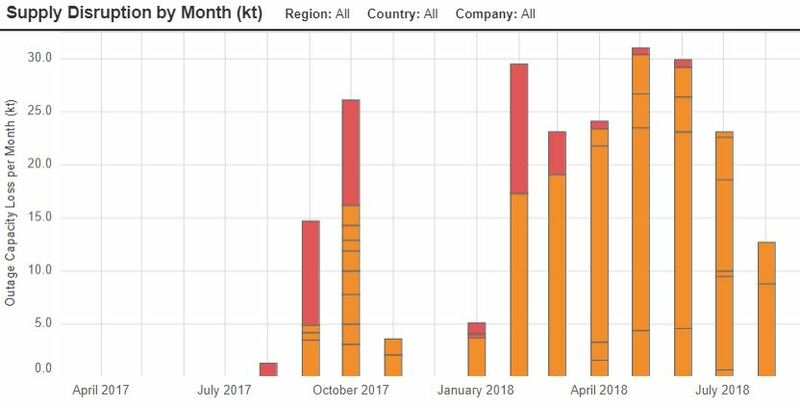 The ICIS Supply & Demand database (see chart below) forecasts that TDI operating rates will increase until 2019 as the new capacities come onstream and other closures come to an end. 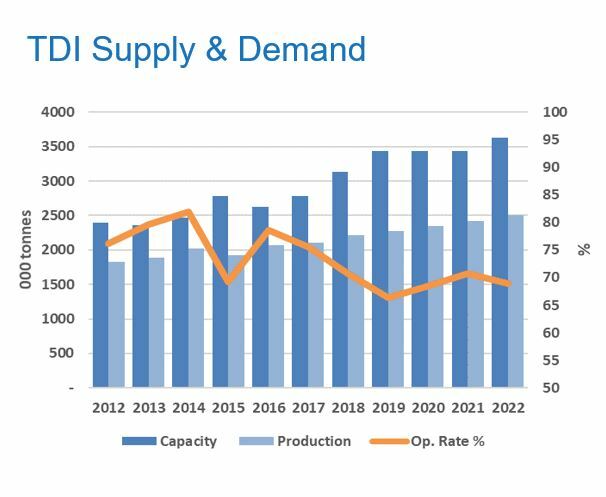 With no new TDI capacity additions forecast until 2022, rising demand will then boost operating rates through to 2021. The TDI market is extremely consolidated, with the top five producers controlling more than 70% of the market. BASF and peer German producer Covestro are the world’s two largest producers. Speaking on Friday, BASF's CEO Martin Brudemuller said: "TDI has seen a special situation seen over that last year and a half, which is now coming back to normal. We have high supplies in the world and of course we have to adjust our volumes." Covestro, with 30% global market share, enjoyed “fly up” margins of €500m in 2017 thanks to the unusually tight TDI market. These were expected to continue until the BASF start-up normalises the market. On 26 July, Covestro raised its guidance for 2018 above the banner levels of 2017 after posting gains across businesses for the second quarter of the year, despite signs that bumper prices for some polyurethanes products are beginning to normalise. “There are currently signs that market prices are normalising in some product areas, especially for the flexible foam precursor TDI,” the producer said. Runaway profit margins for TDI and methyl di-p-phenylene isocyanate (MDI) beginning in 2017 drove a 70.6% year on year increase in EBITDA for the year to €3.4bn, a figure Covestro said it is likely to exceed in 2018 on the strength of results for the first six months. Click here to hear the ICIS TDI pricing team discuss likely oversupply in the global TDI market after the BASF re-start. It was recorded just before the BASF restart announcement.